Last week we talked about making a massive pot of soup in no time, which was great (and I still have a bunch in the freezer), but I got to thinking, what can spice this baby up a bit? Let's take that 30 Minute Canellini and Zucchini Soup up a notch and serve it in a BOWL OF BREAD! Simple enough! YIELD / ONE BOWL - BUT MULTIPLY FOR AS MANY AS YOU NEED! Cut a "cap" off the loaf and hollow out a bowl in the center, leaving enough of a wall so it won't collapse (and also so you can eat it when it is soaking up that delicious soup!). Melt the butter and mix it with the chopped garlic. Place the bread on a piece of foil and brush or spoon the mixture onto the bread, both the exterior and interior of the bowl. Cover it completely! Place the coated bread in the toaster oven on the foil and toast on your bread setting for about 10 minutes, or until the bread starts to turn a nice golden brown. Don't have a toaster oven, no problem! Preheat your oven to 350˚F and place the bread on the foil in the oven and bake for 10 minutes, or until the butter and garlic start to get nice and golden brown. Either way, it will be delicious, its bread with BUTTER AND GARLIC COATED ON IT, HOW COULD THAT BE BAD?! - The answer is, it can't. Take the bread out of the oven and place in a bowl and fill it with hot soup and you're all set! 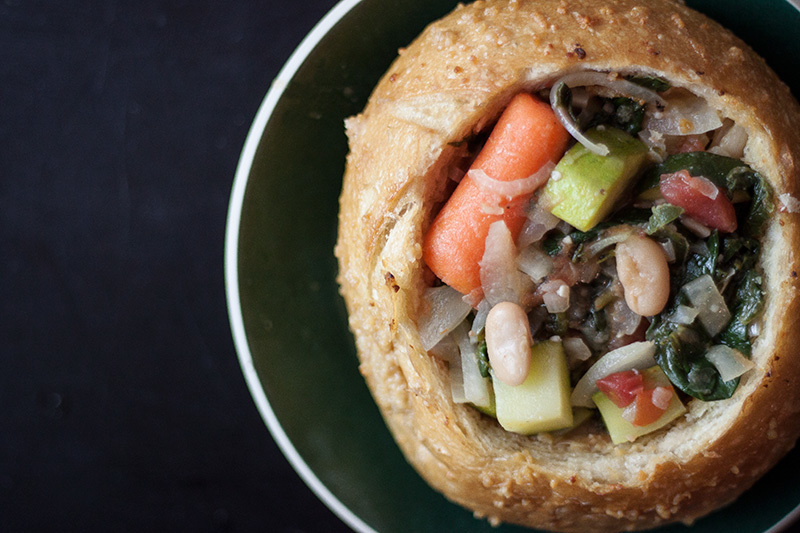 The bread bowl will soak up much of the liquid, and take in even more flavor. As you eat the soup, you can eat the bread too, its like dipping bread in your soup, but even better! I think this would be a perfect meal to whip up during the week, but you could even serve this at a dinner party, pumping up a simple bowl of soup and really impressing your guests. You can add some spices to your mixture to elevate the flavor even more and to accent the taste of your soup. Maybe some fresh parmesan cheese and fill it with a can of tomato soup? How easy (and amazing) does that sound?! This week I'm introducing a new post to the blog: WEEKNIGHT DINNERS. Recently, I have been ordering WAY too much takeout. Admit it, you've been there. You get home from work, you're tired. Maybe someone pissed you off in the office. Maybe the commute was a total drag. Maybe life is just exhausting sometimes. But guys, there are SO MANY amazing things we can whip up real fast or that are super easy to make, so lets start! This week I threw together a super simple tart. This dish is so versatile and so simple and SO YUMMY. Checkout the recipe and some suggestions of different types YOU can make below. YOU CAN DO IT. For the tomatoes and potatoes, I picked up packages at Whole Foods which had varieties of each. I wanted to give this dish a beautiful palette, but any small potatoes or tomatoes will do! Cherry? Heirloom? Fingerlings? Baby Red? Go for it! I told you this baby was versatile! 1 / Preheat oven to 400˚F. Cut the yam into cubes and the brussel sprouts in half. Cut the potatoes also if you feel like should be smaller pieces, you're the one eating this! Toss the veggies in a large bowl with the ¼ cup olive oil, leaves of thyme and a sprinkle of salt and pepper. 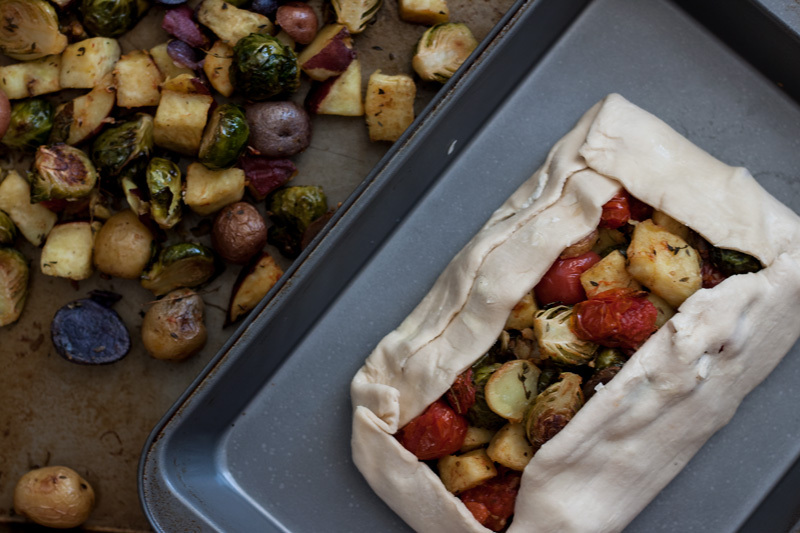 2 / Spread the prepared veggies on a baking sheet in 1 layer and place in your preheated oven for 20 minutes. About halfway through, toss the veggies so they get evenly cooked. 3 / After 20 minutes, turn your oven on the HIGH BROIL setting for an additional 10 minutes, again tossing them about halfway though. 4 / Meanwhile, while the vegetable finish up, lets prepare the pastry! As I mentioned above, thaw it as the package instructs you to do. Mine said to defrost by leaving at room temperature. Drizzle most of that extra olive oil in the ricotta and give it a good stir, leaving some oil to grease your pan. Sprinkle in some salt and pepper to taste. Give a baking sheet a thin coat of olive oil and lay your defrosted puff pastry out. Don't worry if your dough is a little too big for your pan, we are going to fold the sides in! Spread the ricotta down the middle of your dough, staying about 1-2 inches from the edge. 5 / Place the cooked vegetables on the ricotta cheese on the pastry dough. Fold in those edges as pictured above. You will likely have some extra veggies for snacking! 6 / Bake as the puff pastry dough instructs. Typically 25-35 minutes, or until golden brown. I baked at 430˚F for 25 minutes and it was perfect! Not only is it SUPER easy to work with, Puff Pastry Dough is buttery and flaky and QUICK because we don't have to make a damn dough ourselves! This was a perfect dinner. My roommate and I split it and were WAY stuffed. I think it could certainly serve 3 or 4 people if someone else whipped up a side dish, what do you think? Like I said, SUPER VERSATILE! Try out some different veggies! Different cheese! Add some meat! The possibilities are ENDLESS I TELL YOU!